I remember years ago when someone would get a new pair of contact lenses, the doctor would definitely tell them two things: Do NOT wear eye makeup and do NOT keep long nails. We have come quite far from those times and both contact lenses and makeup have evolved much since then. Wear your contact lenses BEFORE you start applying makeup and remove them BEFORE you start removing makeup. Most contact lens advertisements show models with heavy eye-makeup inserting lenses, which is a wrong representation. Lenses: FIRST IN FIRST OUT. If you like to wear makeup on your waterline, please do some good research before buying your eye-makeup. Use only opthalmologically tested eye makeup on waterline. Do not use liquid eyeliner on waterline as it may get into the eye when wet and may also get under the lens if it flakes on drying. 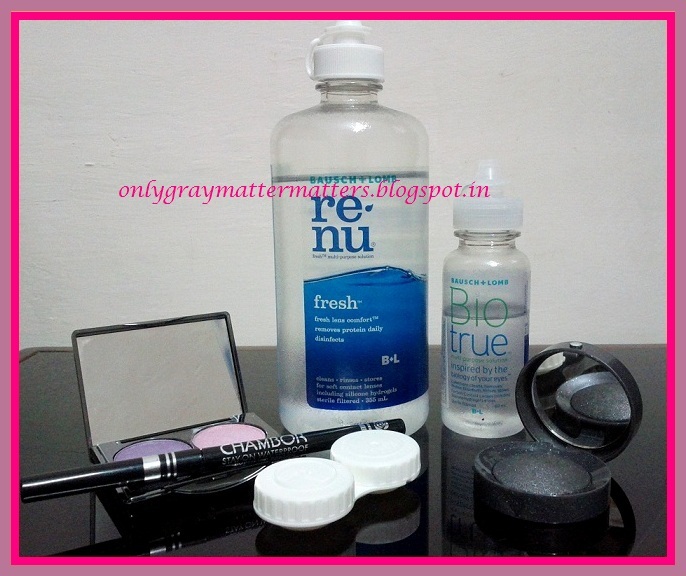 Use oil-free and fragrance-free eye makeup. Do NOT use eye pencils/Kajals that emit fumes and make your eyes water. Avoid wooden eye pencils that require sharpening. The sharp wooden edges may tear your lenses while applying makeup and you won't even come to know. Use twist up pencils (Eg Chambor stay on waterproof eyeliner pencil) or makeup brushes to apply makeup. Apply eye shadow and liner gently, so you don't put pressure on your eyelid ending up damaging your lenses. 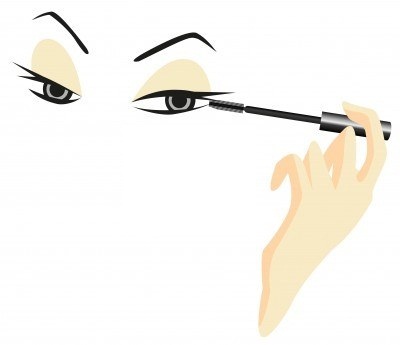 Try applying mascara, starting from a little far from the base of lashes. Avoid mascaras with lash-building formula as they contain nylon fibres which may wither and fall into the eyes, scratching both the eye and the lenses. Use a good eye shadow primer to make your eye shadow stay longer and to prevent eye shadow particles from falling into the eyes. Replace eyeliner and mascara every three months. Most eye makeup is anyways meant to be used within 3-6 months of opening but people usually keep using it for longer, which is not good. Always use clean hands to apply eye makeup to prevent eye infections and store makeup in a cool, dark place away from dust. If you wear contact lenses first thing in the morning till very late in the night, don't use oil based makeup remover as the oil remains in the eye and eyelids and may cause blurry vision and also deposit on lenses. Remove all eye makeup every day using a hypoallergenic and oil-free makeup remover, no matter how tired you are. Try to place your dressing table/ makeup mirror in a well-lit area so you do not have to widen your eyes to be able to see clearly while applying eye makeup. Never ever touch the tip of the lens solution bottle while doing makeup or otherwise as this may contaminate the solution. Don't wear eye lenses and eye makeup if your eyes are red, swollen, watering or infected. Avoid powder makeup or non-opthalmologically tested products on your waterline. Do NOT wear your lenses when you go to a hair salon. Any fumes from the sprays used there can damage your lenses. Do NOT wear your lenses when getting your hair colored, permed or any other chemical treatment. Do NOT use aerosols (hairspray, deodorants etc.) with your eyes open, when wearing lenses. Just close your eyes when spraying and immediately move away from that room as the aerosol particles will remain in the air for some time after the spray. Do NOT wear lenses with freshly applied nailpaint on your fingers, if your nail paint smells highly of chemical fumes. Or apply nailpaint after wearing lenses. What to do if you experience redness/irritation? Dryness in the eyes because of working in dry weather conditions or sitting long hours in front of computer. Feel free to go to a doctor if problem still persists. Do you know that people who wear contact lenses can actually do their eye makeup more confidently and comfortably, since they will have a very steady hand at that as compared to people who don't wear lenses? Human body is designed such that when an object or your hand approaches near your eyes, the eyes send signals to the brain that a 'foreign' body is approaching and brain tells the eyelids to shut and protect the eyes. This is why hands shake and eyelids flutter when you try to apply eyeliner and many women are not able to apply neat eyeliner because of this. WHAT TO DO IF EYELINER OR EYE MAKEUP GETS INTO EYES? If ever eyeliner or eye makeup gets into your eyes and under the lens, and also smears your lens, remove the lens immediately. Wipe clean the eye with a cloth/towel dipped in clean water. Do not dash water into the eye to avoid the rest of the makeup getting into eyes. Clean the lens with lens solution. If the eye is still watering a lot, try wearing the lens again only after some time gap. Call your eye care professional if you have any redness, pain, swelling or irritation. Contact lens wearers are asked NOT to keep long Nails though I do NOT know a single woman who would like to agree to that :) If you like to keep long nails, please take extra care and patience while cleaning, rinsing and wearing/removing your lenses. Nails can damage/cut your soft lenses. Sometimes there is such a minute damage in the outer circumference of the lens that you can't even figure out but it stings like needles in the eyes. So please be careful even if it is like second nature to you. Maybelline eye-makeup is good and cheaper, but it is not opthalmologically tested and also stings on the waterline, therefore unsafe for contact lens wearers. A few Revlon products also sting eyes badly (Eg Revlon Fabuliner). Many good brands (L'Oreal, Chambor etc.) make opthalmologically tested eye makeup which is safe for contact lens wearers, just do your research. 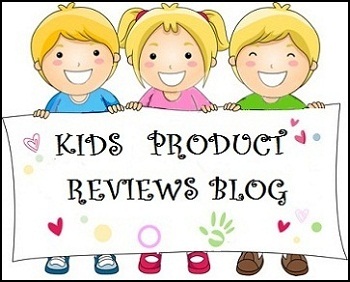 Read many product reviews before buying eye makeup. It definitely pays. Please share any other valuable points you know of. Thanks for reading! For more information on contact lens care and handling, please read the previous article HERE. 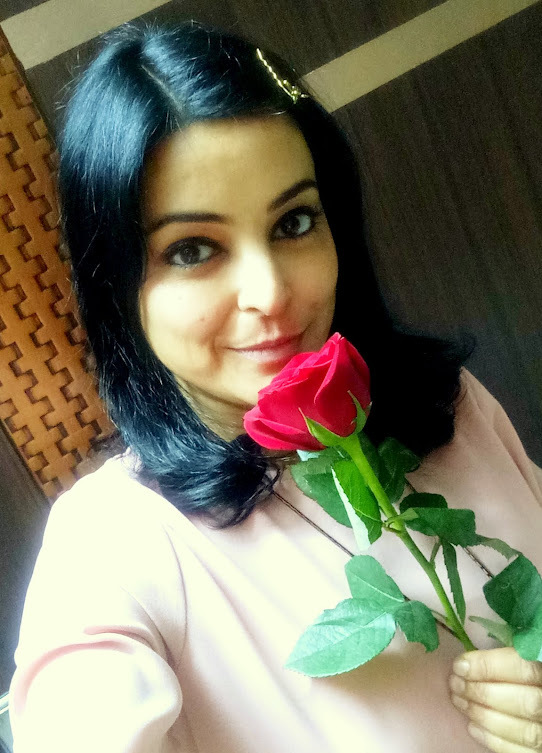 THANK YOU Ruby :) That definitely means a lot to me and your compliment made my day, rather I will remember it each time I write and feel encouraged :) Glad you liked it. Thank you Niesha. Now I know why you are SO good at eye makeup :) of course your talent plays the major role though. Thanks Apoorva. Glad it helped! Dear Jolly, as you may know lenses just float on the surface of our eyes. There are countless women in the world who wear lenses and heavy eye makeup together, whether it is powered contacts or just colored ones for fashion. The problem could be with your makeup technique. 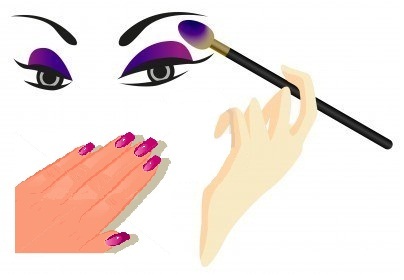 Meaning you may be exerting a little too much pressure on your eyelids unknowingly, when applying eye shadow. Please clarify if you use brush or fingers to apply makeup on eyelids and also, if your lenses stay okay, when you do not wear makeup.